bringing in the firewood supply for winter. This week has been productive, but not in the usual manner. Since returning to 'the property' for our first long stay, we have had a list of projects that all pertain to getting our off grid life set up - solar panels, the well, wiring the house, etc. This past week has been more devoted to the chores that will constitute our established off grid life. The main chore this week has been bringing in firewood. Besides another stop at the business where we can get the scrap lumber (see my last post) we also found two sources of fire wood on Craig's List. One was a one time single load as the people were moving and were not taking the firewood with them, but the other is a local woman and her young son who have an ongoing supply, so we will be making more trips there. Once we have a cold spell that will hopefully decrease the insect population in our woods, I am going to also start dragging fallen limbs etc, down to the house. Our last trip to pick up the lumber scraps also netted us quite a bit of longer length lumber. Between our trips there, one of the employees had taken home most of the scrap wood we could not fit in Truck on our first trip. He said they needed to clean up the area to make room for a work project, so there was only about a quarter of a truckload of wood scraps, and that was mainly small kindling pieces. However, the worker pointed to a large stack of scrap lumber right outside the door and said we could take whatever we wanted of that as well. About half of it was old jigs (templates) they had built to use as guides for constructing various parts of the buildings, and these would not fit in our truck. But there was also a good bit of straight lumber pieces, some 2x6x10', and we loaded all of that on the truck. While driving home, Alan mentioned that we did not have to cut up all the lumber for firewood, we could leave it as is in case we came up with another use for it. We could always turn it into firewood at a later date if we needed it. Little did he know I was already thinking of plans for it. The 'soil' on our property if about 90% rocks and 10% dirt, so I have been planning on putting in some raised beds for a garden. Until this week, this has been one of the longer range plans - maybe working on building the raised beds this winter as time and funds permit to have some ready for spring planting. But, with the free lumber, and the fact that I saw Lowe's has some raspberry and blackberry starters on clearance last time we were there, may move this project up on the list. 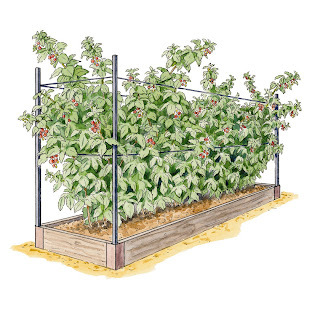 That night I googled growing berries in raised beds to make sure my idea would work. I did not know if the plants would survive the winters in raised beds verses having their root system in the actual ground. I thought the dirt in the raised beds might freeze more and not sustain the roots, but I found plans online for making raised beds for berries, so it doesn't seem to be a problem. Now I just need to get back to Lowe's to pick up the berry starters before they are all gone. BTW, last time I was there I picked up a gallon of 'oops' stain that I did not have a use for, it will be perfect for staining the raised beds. The only uncertainty left now is if the berries will survive such a late season planting. All the recommendations I read said to plant in the spring, but the plants are cheap enough that it is worth a try. If they don't survive, I will still have completed constructing some of my raised beds. keep falling onto the deck. I have covered most of these phases in previous posts, but here are a few details on the newer ones: bees, caterpillars and oak tree seed-thingies. The bees are something we are familiar with up north, come the first signs of fall the honey bees seem to become both lethargic and aggressive at the same time. Up north we would notice them buzzing around garbage cans at picnic events and such. Down here they are more noticeable, probably because we are outdoors more and they tend to hover around us as we work. The caterpillars were discussed above, but they actually tie in with the small black granules (seed-thingies) dropping from the oak trees and covering our deck. just swept it clean a couple days ago. I am guessing these things are only falling from the oak trees because they are only collecting on the deck beneath the oak trees. If you stand quietly on a calm day you can actually hear them falling throughout our woods. The are falling so steadily it sounds like a gentle rain fall. Sit outside, and you feel them hit you as they fall. It has rained once since these started accumulating and after the rain they all looked like small brown gelatinous blobs (think small life slugs). Yep, they were as gross as it sounds and there were thousands on the deck and the glass top patio table we had just placed out there for the solar oven. At that point, I became even more confused as to what these things were. If they were a part of the tree, I did not think they would dissolve when they got wet. However, when wet they did turn the water they were in brown, just like the tannic acid in oak trees does. come to our property and brought a lot of friends. porta-potties for such along event. I decided to google it, but it took a few combinations of search words to get a possible answer. 'Oak tree seeds', of course, brought up articles on acorns. 'black granules falling from oak trees' got me a bit closer with lists of various diseases that can attack oaks. By following a few threads I learned that there are both aphids and caterpillars that can devour oak leaves and that these black granules are frass, which is the scientific term for caterpillar poop (yuck, those hard little beads fell in my hair when I was sitting on the deck!). To verify this, I was contemplating placing a caterpillar and oak leaf in a jar to see what showed up, but I really didn't want to confirm this. I did check out the oak branches above the deck and most have been eaten bare. I did google 'caterpillar frass' and, sure enough, there were photos that confirmed this phase was being generated by the caterpillars and not the trees, well technically the trees were a part of the cycle. When I told Alan the results of my research he was still in disbelief, how could there be so much caterpillar poop falling from the trees? I showed him the bare branches that contained only scraggly leaf skeletons and it became a little more believable. Plus the fact that we know the oaks are homes for myriads of katydids during the summer makes it more plausible that they can become a buffet for thousands of caterpillars as well. Today we came across what may become yet another phase of nature down here, although we are hoping it does not follow in the footsteps of the population explosion of katydids and caterpillars we experienced this Summer and Fall. We saw our first snake! We actually only saw the last couple of feet as it slithered under Scoot (our VW), not enough to confidently identify it, but what we saw was solid black and I am pretty sure it was a North American Racer which is not dangerous. These changes in nature through the year are fun to observe, we are learning a lot, but won't let it 'phase us' too much! I'll keep you posted as we move into Fall in the Ozarks!Now I'm off to wash my hair again! Meet Reggie, the wood burner. He has a very warm personality. As is often the case, the title of this post may be a bit misleading, but we will get to that in a little bit. First I will list some of the items we worked on this week. I have been jotting them down on a list because there have been a lot of 'odds and ends'. 1. The wood burning stove is installed in the living room and has already been put to use. We had a few gloomy rainy days this week and the evenings got downright chilly. We made a trip to a fireplace store to pick up the lengths of stovepipe needed to connect the stove to the existing chimney pipe that only came a couple feet down from the ceiling. The pipe that passes through the ceiling and roof is called 'double-wall', it is a pipe inside a pipe, so that the part that touches the ceiling and roof don't get hot and start a fire. The part we had to install is called 'single-wall', and does get hot, which is what you want to help heat the room. Smoke from our first fire. Our first attempt was using the less expensive sheet style of chimney pieces that you wrap into a tube and 'snap' together. This was the only type available at Home Depot and Lowe's. We quickly learned that the 'tubes' created were more heart shaped than circular and thus, impossible to work with. The pre-made welded-seam chimney pieces were much easier to work with and created a much more airtight fit. The day we finished the project, the temperatures had again risen back up into the low 80's, and while it seems counter-intuitive, we just had to light a small fire to test out the stove, rather than waiting for the next chilly night. Since then, we have had several evenings and one morning where we have put in a small fire to take the chill off. 2. With the new wood burner, we now needed a supply of wood. Realize, our 20 acres is solid forest, but with all our other projects this first year, we did not want to take on sawing and splitting wood to stock up for winter. I started checking Craig's List for firewood for sale in the area, and then Alan came up with an idea that I was a bit dubious of. In a town not 'too' far away there is a company that makes very nice wooden storage sheds and cabins. Alan suggested we stop there to see if they ever have scrap lumber. The owner said they tend to always have scraps and he had some that were not 'spoken for', so we told him we would be back the next day with our truck to load some up. I asked Alan how much they were charging to compare it to the firewood prices I had seen and he said it was FREE! Our first load of FREE wood! The next day we drove around the back of one of their buildings and one of the workers gave us each a cardboard box and pointed to a pile of wood scraps laying around four table saws. We filled the 8 foot bed of the pick-up truck and only took about half the wood that was there. They said we could come back in a week or so to get another load. We asked how large the work crew is because we plan to bring donuts next time. The wood is all from 2x4s. About 75 percent is triangles that when you put two together they are back into the shape of a 2x4. Most of these are about 8 inches long, but some are longer. The other 25 percent are ends of 2x4s that are between 4 and 10 inches long with one end cut at an angle. Once we got the wood home, Alan unloaded it while I stacked it. I became fairly fast at fitting together triangles to make rectangles for neater stacking as well as matching up various sizes of the end cuts for even stacking. Alan said it reminded him of some type of challenge they would have on 'The Amazing Race' reality TV show. 3. The kitchen cabinet knobs are completed. After my last post, several people told me they wanted to see the finished project. I want to thank them because that gave me the incentive to get all the knobs attached. I realized I could not really show all the knobs with any detail by posting pictures of the cabinets 'as is'. I told Alan I was going to take photos of all the knobs and then crop them and create a collage of them all and he said 'Oh, like the Doors of Ireland posters you see in Irish gift stores.' I agreed but said this poster would be The Knobs of the Ozarks, which is really quite appropriate because the conical hills found in the Ozarks are geological formations that are called 'knobs'. Rather than Walton's Mountain, in the Ozarks it would more likely be called Walton's Knob. Well, there are a few more items from this week, but I need to cut this short due to the activity that is the reason behind the title of this post. I have a confession to make - we have bought a TV. Now I could say we bought it to keep up with world events, but in actuality Alan realized that Survivor starts the new seasons this week, and Amazing Race starts at the end of the month. Yes, we were looking for a 'reality TV fix' out in the middle of nowhere. However, we are still being 'primitive' about it. It is a very small TV (7 inch) which we can run off of our solar system (still get a kick out of saying we have a solar system (and we still believe Pluto is a planet)) and it uses old fashioned 'rabbit ears'. We can pick up some stations inside the house, but we discovered we can only get the channel that carries 'Survivor' by sitting outside on the deck and one of us has to hold the TV just the right way to improve the signal. Let go, and you loose signal strength. So, with the evening turning chilly, and the premier episode of Survivor starting in a few minutes, I need to go bundle up so I can enjoy a bit of TV time. It better be a good season this year if I have to sit out on the deck in December to see who wins! Hope the weather holds out for TV season! First let me say that I am writing this post under duress. One of my daughters has threatened to withhold posting pictures of my new granddaughter on Facebook if I do not post a new blog entry soon. Actually, I have been thinking about my next topic for a few days now, but hadn't realized how many days had passed since my last entry. Time flies when you are having fun (or getting caught on client projects). While, the 'Never Ending Projects' in this post's title could refer to the fact that the list of projects in our new lifestyle will probably never end, I am actually referring to a few projects on the current list that seem to be going on forever, and also those that have been transferred from old list to new list several times without ever getting started. Thanks to another 20% off coupon at Harbor Freight, we have completed the size of array we had planned for. There are now 18 panels which fills the length of the wall on the south deck. With all these connected into our batteries, our charge controller now shows we reach 'float mode' most afternoons. This means the batteries are charged to capacity. The next items on the solar power list include (a) purchasing more golf cart batteries since we have the capability of storing more power during the 'float' period and (b) determining what trees we want to take down on the south side of the property that are currently causing shade to fall across the panels at various times during the day. With the sun traveling lower in the sky each day, we are seeing more shadows on the panels. As these are about 50 foot oak trees that are about 25 to 30 feet from the house, we will probably hire a professional to take them down. Remember the last tree we took down that was blocking the panels? After we pulled the old submersible well pump, we had determined it had been 200 feet down. Assuming the hand pump we want to replace it with would have to go to the same depth, it will cost us about $2,000 in equipment and piping to get it in place. In the meantime, we have constructed a tripod over the well and attached a torpedo bucket that is raised and lowered using a windlass (a piece of equipment usually found on sail boats for letting out and taking up rigging ropes). The torpedo bucket is a long narrow bucket made out of PVC piping that fits down the well shaft pipe. 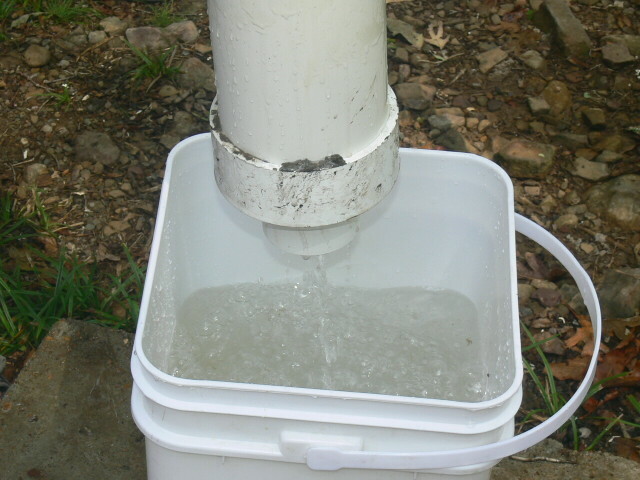 Once it is lowered, it automatically opens a valve to fill with water, and once filled and raised back to the surface, there is a mechanism at the top that opens the trap door at the bottom of the bucket to release the water. Our first water from the well! The bucket holds 2 1/2 gallons of water, so while not the easiest option for getting water right now, it does ensure that we can get water directly from our property at any time. One other side benefit to this project is that we determined the water level in the well is actually at about 100 feet down, not the 200 feet that the submersible pump was at, that will reduce the cost of our final well pump solution by quite a bit. Maybe Alan can market these. Let us know if you want to order any! Our office is now set up and fully functional on our 12 volt system. We have a power strip that supplies 12V within our office. Alan created a dozen pigtail adapters; one end is a standard 120V type plug to go into the power strip, and the other end is a cigarette adapter socket to plug in our 12 volt equipment. We have connected in our 2 laptops, two auxiliary 20 inch monitors, two desk lamps, two area lamps, two small fans, a shared printer and a label printer. Yes, this room is the biggest power draw in the house, but so far, we have never drained our batteries, even when we are both working at night. We do keep power usage/conservancy in the back of our minds while working, like only using the larger monitors when they are beneficial for work, such as when writing code, and turning them off and using the laptop screens for Facebooking, etc. There is a sliding glass door just visible on the left side of the photo that leads to the deck on the north side of the house. I can't wait to see these all attached! 6 down, 36 to go. There are a total of 42 drawers and doors on my kitchen cabinets, none of which have ever had any knobs or pulls installed. When I went to buy knobs and handles, I was a bit surprised at the cost of the hardware and at the vast array of choices. One day I noticed Hobby Lobby had an entire aisle of unique and colorful knobs and pulls and I came up with the idea that I wanted to put a different knob on each drawer and door. 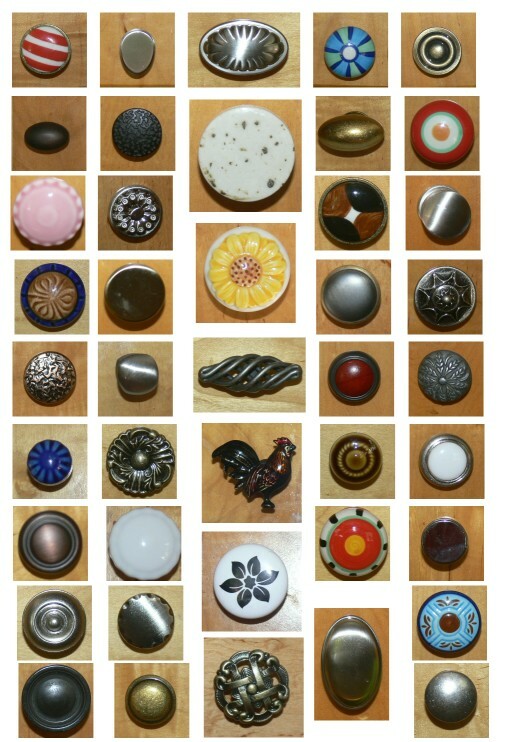 And so my quest began of collecting 42 different knobs. I made it more difficult by specifying that they had to be the style where the screw was separate from the knob so that I could use hanger bolts (a new hardware term for me!) to screw them into the cupboards. Hanger bolts are threaded like a machine screw on one end while the other end is a wood screw. Therefore, I can thread each knob onto the machine screw end and then screw them into the cabinets. This eliminated many of the Hobby Lobby knobs which have bolt style attachments permanently affixed that are designed to go through a hole drilled in the doors and then held in place with a nut inside the door and excess bolt length sticking out to catch your hand on. It was probably a good thing I decided not to use any that were this type because my collection would have been much too 'wild' with all the knobs being multiple colors, etc. This way I have a mix of more traditional style knobs and the brightly colored ones from HobLob. One other stipulation that has drawn out this project is that I had set a price limit of what I was willing to pay for each one. On my birthday, I did allow myself to buy a couple that were over this limit and that brought me up to the total number needed, so this project actually has an end in site now. So far, I have installed 6 of the 42 knobs. I was going to complete the rest this morning, but as I want to see more pictures of my granddaughter, that project has once again been delayed so I can get this blog out (thanks Andi...). In my last blog post, I described the process I came up with for cleaning, prepping and painting our floors. So far, I have only painted one of the five rooms that need to be done, and areas wise it is probably about an eighth of the total floor space, as the living room is much larger than the office (the room I have finished), and the three bedrooms which are also still on the list. Plus, in the office I only used one coat of paint and no polyurethane top coat. I dubbed this first floor 'experimental' to determine if multiple coats and a clear coat are needed. While the office floor is 'fine' I have determined I will not be happy with the same results in the other rooms so I will take the additional steps on them. We are prepping to install our wood burning stove in the living room, but last night Alan said "No rush, but we should paint the living room floor where the stove is going before we install the stove." He may be thinking 'no rush' but the last few night have gotten down to about 50 degrees so I am now inclined to move the living room floor project higher on the priority list. ottoman/storage and side table chest did not. You may recall a couple posts back we purchased a lot of 'some assembly required' furniture. While some of this assembly has occurred, there are still lots and lots of sundry parts and pieces waiting in our guest room, aka warehouse. As we had to open several of the boxes outside and move the contents into the house piece by piece as the boxes were too heavy for us to carry up to the deck, we have to be careful to not rearrange the parts awaiting to be assembled lest our kitchen island end up with shelves from the bedroom wardrobe closet. The good news is we now have a living room to relax in. The bad news is, we now have a living room to relax in, which leads to the other topic in my title "distractions". As we become more and more comfortable based on newly completed projects and find we are coming up with less and less 'needs' we want to conquer, it is easier to set a project aside in order to explore the area or have some down time in the evenings. When preparing for my trip to Haiti several years ago, I discovered I had been celebrating the wrong birthday for 49 years. My actually official birthday is recorded as the day after the day my family always believed was my birthday. (A long story that involves being born at midnight.) With this knowledge, rather than changing my birthday, I now celebrate both, even though my son informs me that I am now aging twice as fast now. So, this week, Alan took me 'to the city' on both birthdays and we started checking out various BBQ joints which are prolific around here. Some may think this one needs to go up in the never ending chore list, but to me it is a good excuse to drop what I am working on and go outside for while. We did have several rainy days this week so I have not been able to do this as much as the previous week. The current 'pinch' count is at 1700, an increase of only 400 this week. While wanting to work on various projects, I need to stay on top of all the day-to-day chores around here. As we move deeper and deeper into this lifestyle there are some weekly and daily chores that take longer than they did in our old life. For example, laundry. While in the old life I would throw a load of laundry in the washer, forget about it and then throw it in the dryer an hour later. OK, usually a few hours later, there were distractions in the old life, too. In this life I can not throw it in the 'washer' and find it magically cleaned and rinsed when I come back an hour later. I am tied to that chore for a couple of hours depending on how many 'loads' I am doing that day. The last time we were up north, Alan loaded a mini series we have been wanting to watch, The Hatfields and McCoys, onto his tablet. Now that we have a sofa, we have sat down in the evenings after dinner to watch this. We usually stopped each nights viewing when the tablet shut off due to a low battery. Maybe I will add a blog page to show completed puzzles. 5. We Started a Puzzle! I love jigsaw puzzles, but very rarely start them because the can become a major distraction to me. However, since we started preparing for this life several months ago, I started collecting puzzles with plans to always have one set up, especially during the winter. Last night, I was working in the office and Alan pulled out one of the puzzles and started working on it. I finished my work and joined him, and so our first puzzle project has begun. I am sure this will not be a never ending project but it will be a distraction. If the words in the title of this post all referred to one thought, you may think we have become disenchanted with our new life style rather quickly, but that is not the case. These words just came to mind this week with a couple of projects we were working on and a future project we were discussing. First, the stinking. You may recall the condition we bought the house in, and in particular the carpets I pulled up from several rooms. Ever since then, while the overall funky smell in the house has dissappeared, on wet humid days this not so pleasant odor permeates the air in the house once again with the main source being from the room we are going to turn into our office, the one that had the broken sliding glass door as well as the worst of the carpeting in the house. On previous trips, I have scrubbed that floor multiple times with Pine-sol, yet every time the weather turns rainy we discover we have not yet completely conqured the beasts that used to occupy that room. Alan wants to get the office set up this weekend, so this week I was determined to irradicate the funkiness once and for all. First on the list of solutions was wetting down the floor with water that had a strong concentration of bleach. The plan was to use enough water so the bleachiness could soak in and eliminate the elusive stinkiness. The result - better but now there was a distinct bleach smell along with a less strong original odor. Step 2 - sprinkle a large box of baking soda over the entire floor and let is sit for several hours before sweeping it up. These results - much better and we thought we had conquered it until it rained the next day and the smell once again returned for an unwelcome visit. We were running into town for some project supplies that day, so we picked up two products designed to eliminate pet odors. One was specifically for hard surfaces, while the other emphasized use on carpet, but it said it worked by soaking in and breaking down the odor causing stains, and it could also be used on hard surfaces. So Step 3 was a spray bottle, followed by Step 4 which was a squirt bottle. The spray completely covered the entire floor while the squirt bottle more or less drew squiggly lines on the floor. This fourth step actually turned out to be very beneficial because I could squirt along each seam in the plywood floor so it would soak into the gaps just as I am sure the 'offensive odor causing stuff' had also seeped into the cracks. The result - SUCCESS! I got down on my hands and knees, put my nose to the floor and crawled around while inhaling deeply. Not a pretty sight (no pictures) and I felt like a human bloodhound but I was extremely happy because the odor was completely gone. As one final step, I had picked up some 'Kilz' paint (on the 'oops' rack at Home Depot) that was supposed to cover odors. We had planned on using this on the floor first, but wanted to make sure the odor was not so strong that it would still be smelling after we painted, at which point there would no longer be any other recourse for the taming of the pew. After the Kilz came the actual floor paint. Well, not technically floor paint, but an exterior semi-gloss enamel, Another gallon of Oops paint I had picked up for $5. As this is the first floor we have painted in the house, and did not use true floor paint because I have not found any within the price I am willing to pay, this floor will serve as a testing ground to see if the exterior enamel will suffice as floor paint. Next is the sinking. After moving in the wood burning stove last week and then several heavy pieces of furniture, Alan commented that the deck felt like it was shaking when we walked on it. He went under the deck to check it out and discovered the deck was no longer attached to the house below the French doors in the kitchen, which was the doorway we used to move all the heavy items into the house. We have since picked up four floor jacks and a couple of 4x4 pieces of lumber and have jacked up the deck, Next we will run some lag bolts through the deck beams and into the house beams to join them together. And now the re-thinking. This past week we attended an emergency preparedness fair as well as a county fair and each event has had several vendors displaying storm cellars. Well, for several weeks Alan has been listening to me go on about how I want to build a root cellar on the property, probably into the mountainside behind the house, but it is very rocky. Alan even found an altrnative solution showing how to turn an old chest freezer into a root cellar. That sounded even better to me, but we would still have to dig a hole large enough to bury the freezer. This would probably require a pick axe in our yard. Now back to the storm cellars at the fairs. There are two types, ones that are built inside the house that are basically a closet constructed from reinforced steel and ones that are buried in the ground and look like a concrete vault. While driving home, discussing how a storm cellar could double as a root cellar, Alan said "You realize, we already have a concrete vault buried right out in the yard." Of course, our cistern! Because we have always thought of it as being used to store the rain water we capture, we never considered it could be used in any other way. Many people in the area store water in large water tanks that are sold at local farm stores, and in fact, you often see these large water tanks in the backs of pickup trucks as people are heading to the nearby spring to fill them up. A large tank like this would be more convenient to catch and store rainewater in than the concrete cistern plus that would enable us to convert the cistern into a root/storm cellar. It already has a large round opening at the top with a cover that could be used as the entrance. I am sure more details will be included in a future blog post. Writing about rain water reminded me of yet another unplanned project this week. I tend to have ideas that pop into my head several times a week that end up pulling Alan away from his planned projects, and this was one of them. With all the news about hurricaine Isaac this week, including reports that we were in for a lot of rain, I came up with the idea of attaching one side of a tarp to the north side of the house about 6 feet above the deck and than taking the bottom of the tarp and stretching it towards the deck railing so that the tarp was rising at about a 45 degree angle from near the deck railing up to where it would be attached to the house. We could then place plastic totes under the lower edge of the tarp and all the rain falling onto the tarp would be collected in the totes. While this would not collect as much water as when we had caught run-off from the roof, the water would probably be much cleaner as it was running off a brand new tarp rather than the roof. After dragging Alan out to the north deck and explaining my plan, I then had another thought. Our solar panels are all located on the south deck and one thing that we have been pondering about them is a way to devise some sort of protection during bad storms with possible hail. With the remnants of Isaac approaching, hail was a possibility. We had saved all the styrofoam sheets the solar panels came packed in and our initial plan was to accordion them all together, sort of like the old Jacob's Ladder toys, so they could be pulled out and attached over the long row of solar panels in some manner (obviously from that description we had no solid plan, yet). So, I started rambling on to Alan about my next thought. If the experimental tarp works well on the north deck, we could place hooks above the solar panels, get a longer tarp, or multulple tarps that could be used as water catchers over all the panels and they would serve the dual purpose of gathering rain water and protecting the solar panels from possible hail. Plus, I thought we could deploy this system much more quickly than the styrofoam accordion if needed. Alan said it would be easier to go head and put the prototype on the south deck rather than the north so we set it up before the rains arrived last night. Isaac never got to us, so the weather has not been nearly as severe as was predicted, basically a gentle rain that started after midnight and has continued off and on today. This morning we discovered several inches of clean rain water in each of the totes. We were able to fill a couple 5 gallon bottles as well as Maycee's automatic waterer (she has about doubled our use of potable water since we brought her down to the property). The beta version tarp only covers about a third of the solar panels and later in the morning we saw the uncovered solar panels were still providing a low charge to the batteries despite the overcast day. So, we unhooked the tarp from the deck railing and folded the bottom up to attach it to the hooks on the house as well so all the panels were once again exposed to whatever sunlight was available on this gloomy day. As I am writing this, night has fallen and the wind is picking up indicating possibly more rain tonight so I am going to take a break and go set out the tarp once more. OK, The rain catcher is deployed and I am back. Just one more story about this week's activities. We have accomplished a lot this week and I have discovered another way in which Alan and I make a good team. He excells at one type of project while I am better suited for another. Basically, Alan can plow through projects with lots of intricate steps much more quickly than I, while I can stay on task with the more monotonous chores longer than he. Case in point, while Alan was building various pieces of the furniture we purchased, all of which involve pages of numbered instructions and dozens of screws, nuts, bolts, etc., Maycee and I spent hours walking around the yard picking up much of the tiny debris that covers the property. I have included a photo of a small area of the yard (several square feet) so you can get an idea of what is currently considered 'ground cover'. The yard around the house is littered with beer bottle caps, shattered beer bottles, rusted hardware, various car parts and a myriad of other small items. The crew that was hired to clean up the property and the house before it went on the market probably expended their allotted time on the 'big stuff' and thus our interesting mosaic of yard art. Hmm, the density of beer caps decreases relative to the distance they are away from the deck. Does that mean the more beer you drink the less distance you get on you beer caps when you toss them? At least they were consistent, every single one of the hundreds of beer caps that are still legible are Busch Light. My arm is getting tired of working the pinchy fingers, it is like squeezing one of those stress balls hundreds of times. I am going to go find some of bigger items to fill the bucket quicker. Why do I keep counting each time I grab somthing, even with all these other thoughts running around in my head? I hope the tick repellent granules are still working in the yard. I wonder how heavy of an item this plastic rod can pick up. OK, to be honest, I just didn't want to bend over and pick up the heavy items, like broken disc brakes, adjustble wrenches and a meat cleaver, but I convinced myself it was to test the durability if the grabber thingy. Want to play 'I Spy'? There are at least 20 bottle caps in this photo. I wonder what percentage of all this garbage is comprised of beer caps. Per item it is probably over 50% beer caps but by weigth is is probably about 15% beer caps. I would probably make a good archeologist the way i am fiding all these little bits of stuff in the dirt and rocks. That was the fourth rotting dog collar, I guess that helps explain the stinky floor. Oops, almost missed that styrofoam cup. That just about tops off this bucket full. What is that rumbling noise? YIKES! There are about a dozen wasps crawling out of that styrofoam cup and I am still holding the bucket. At that point I dropped the bucket and quickly but carefully walked back to the house so Alan could perform a wasp check to make sure there were no wasps in my hair or on my clothes. One other thought I had while filling buckets with a vast array of interesting debris was trying to come up with a way to make this post interactive. For some reason I started counting each item I clunked into the bucket from the pinch fingers. I think it was because I originally started doing this chore every time I let the dog out into the yard. I would go down off the deck with her and tell myself I would pick up 100 items before coming back in. Well, I actually found this chore to be addictive and rather then setting a goal I had to reach each time, I instead had to set a limit at which I had to get back to work on another project.